It seemed friendly and never bothered me so I let it move about. 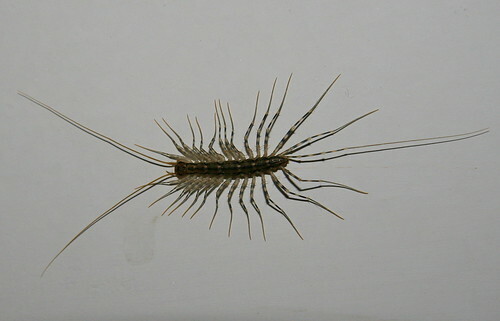 I'm scared of few animals, but I really don't like the way centipedes and millipedes move, somehow it just creeps me out. In fact this one was ok, but the huge one I saw in the Australian outback still haunts me. Anyway, I was taking a look around to find out more about the beast above and came across some information about the Amazonian Giant Centipede which can grow to over 30cm. This video from Youtube is pretty graphic and shows what such an animal can do to a small mammal. It's startling to say the least, and frankly gives me the creeps.